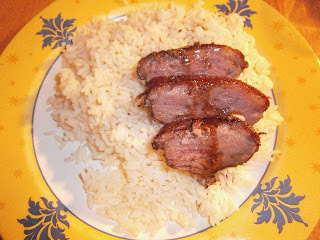 Here is a duck recipe, it is very nice. Preslice the magret like in the picture on the skin side without cutting it off. That way the slices will stick together and have all the same shape (you will see the size reducing during the baking process) and it will be easier to cut it once ready.. Add salt and pepper on both sides. Put in a dish and bake for 10 min in the oven at 230°. Meanwhile, heat up the honey, the vinegar and the spices in a casserole dish. Cook for a few minutes. Once the magret has baked for 10 min, turn it upside down and bake for another 3 min. 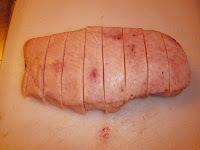 Get rid of the fat, cover with the sauce and put again for 1 min. then cut and serve with white rice.